Well, I've finally made it- to the end of a swim/bike focus phase that began six weeks ago, and to the end of the extra work hours I took on back in mid-August when my coworker went out on maternity (the last few weeks have been a bit tiring, to say the least). Anyways, next week will be back to a 32hr/week schedule, with two mornings a week completely open and three other days of starting at 9-11 AM- can't complain there! It also coincides with recovery week (whatever am I going to do with myself? Laundry? Cleaning? Paperwork? Ew. Walk the dogs in the woods? Better). So, although off-season life is less than thrilling, I'll update a bit on the highlights. C. I learned how to not hate swimming (I still hesitate to give Mary the satisfaction of saying "like" and "swimming" in the same sentence). I will admit that I sort of enjoyed myself in a pool during Mary's birthday swim, though (minus for when I had to do stuff that didn't allow me to breathe every stroke). D. The only thing saving me from getting really, really feisty from not running is the total body fatigue that comes about from raising training volume by, say, 50% from what I've been doing for the past two years. When this past week started, I honestly had no idea how my body was going to respond to the volume increase. Fortunately, it behaved; my stubborn streak came through to push me through, as well. I'm well aware of how fortunate I am to be able to race professionally this year; I know many people would love to be in my position; and I feel that I have a responsibility to make the most of the opportunities I've been given and the chances I'll hopefully have in the future. Giving in or slacking off doesn't factor into that. Now that it's all said and done, I'm beginning to see some results. In the offseason, they're small and of debatable significance (I know how to interpret running workouts; without them, though, biking remains somewhat mysterious to me), but I'll take what I can get. My second of 2x1600y was swam on Wednesday at the 800 time trial pace I celebrated five weeks ago, which was swam at a pace that I used to be happy to swim 200y at. Finally, hope that (if I can hold it together in open water for once), I'll at worst be a close last out of the water. Every Computrainer ride this week was done at the same HR and just slightly higher wattage than the same ride last week, which was done at the same HR and just slightly higher wattage than the week before (and so on). Given that this is the first winter I've trained on the Computrainer or with any sort of power numbers, I have zero frame of reference for how to interpret this; I don't know how many watts it takes before it means anything, I don't know what it means for outdoor riding, I don't know if what I'm riding at is even remotely respectable (if I don't bike any faster than what it's telling me I'm doing, after all, I'm screwed), but I'll take it. And then today, even with the minor amount of slow running I've been doing, my body decided that it'd stay in zone 1 while running a pace that I can almost feel ok about for the first time, well, ever. Baby steps. My faith in what I'm doing, in my coaches, and in QT2 continues to grow day by day. 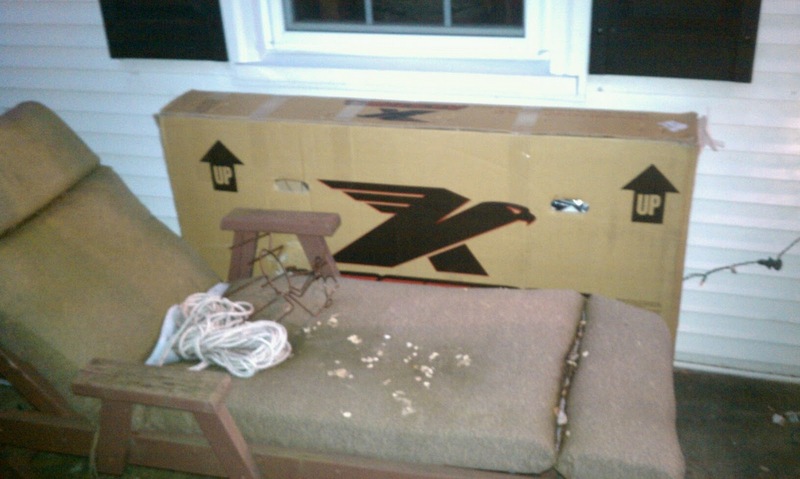 Good thing UPS hid it so well. Apparently, in Irondequoit it's not ok to leave a $7 laptop stand outside a house, but leaving a bike is totally cool. 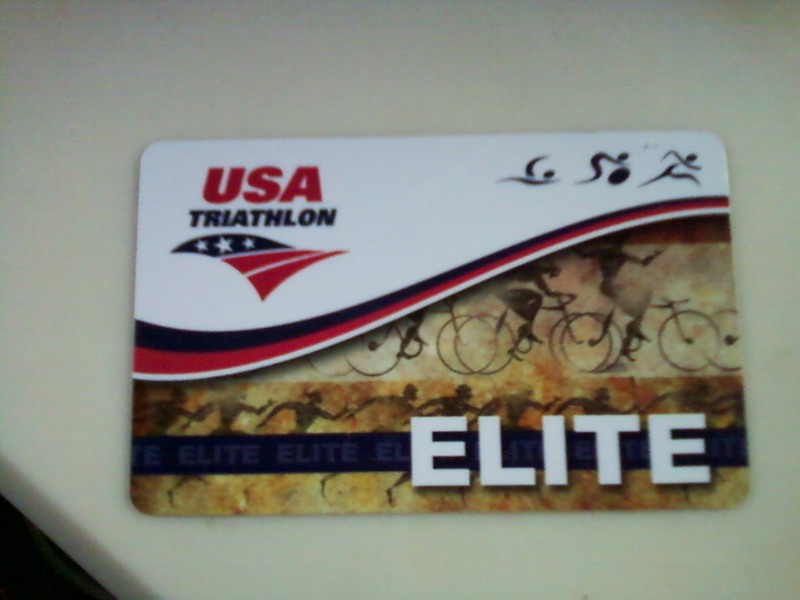 Although my status has been updated on the USAT site for close to two months now, somehow having this little piece of plastic in my hand provided some sense of relief that I'm all official now and stuff. Here goes nothing. Another partnership of sorts that I'm pleased to announce is with Ridecarbon.com. Ridecarbon.com was the company that gave me one of the best (and most generous) race prizes I've ever won-the Gray race wheelset I received for winning Musselman. I still remember sitting in the grass before that awards ceremony, watching a wheelset being pulled out of a box and thinking, that cannot be my prize! Well, somehow, (very) fortunately for me, I walked away with a wheelset that I love, and that certainly played a role in my improved bike splits over the rest of the season. 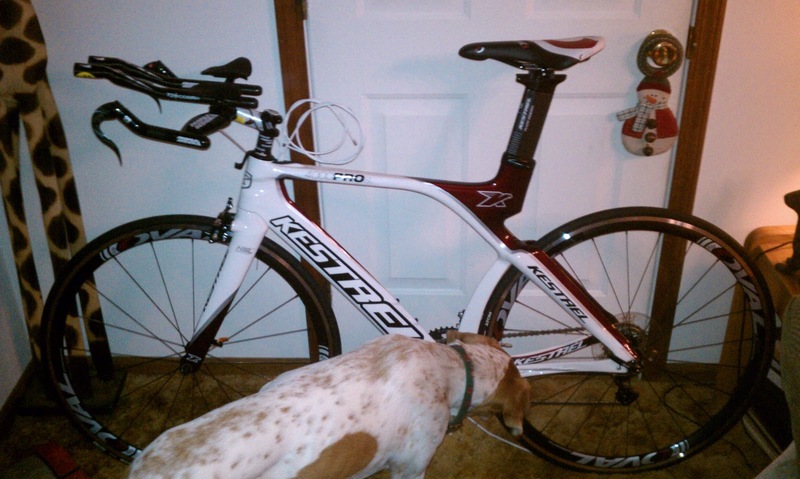 Ridecarbon.com is in the process of becoming a source of gear, nutrition, and information for triathletes. I'll be doing some article writing for the site on various topics in order to contribute to the information part; I was excited to be asked to do this, and I'm certainly looking forward to getting started. Finally, and somewhat ironically, given my recent training breakdown, last night Dave, my parents, and I enjoyed the Greater Rochester Track Club's annual Rochester Runner of the Year Awards banquet. I had managed to nab third place overall last year; Dave had found himself with an age group award, as well. As always, I enjoyed catching up with the running community and watching the Hall of Fame inductions (some moments did bring about a little former Penfield pride, too). I know I'm going to miss participating in the running scene as much as I have next year, but I did put down "Ironman Lake Placid" as my goal race for 2012 on my awards bio form. 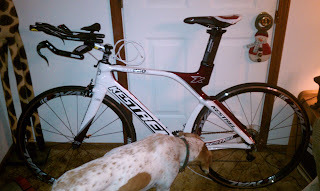 I then came home, went to bed, and woke up ready to hit the bike, continuing to trust that it'll be worth it in the end. Until then, I'll be enjoying my recovery week (instead of complaining about it), and counting down the days until QT2's Florida training camp the week after next!